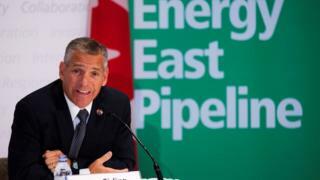 Energy infrastructure firm TransCanada has abandoned two major Canadian pipeline projects. It will no longer proceed with its proposed Energy East Pipeline and Eastern Mainline projects. The decision comes after Canada's national energy regulator expanded its review of the projects in August. The Energy East has faced fierce opposition in some communities along the pipeline's route and from some indigenous groups. In a statement on Thursday, TransCanada president Russ Girling said the decision comes "after careful review of changed circumstances". On 7 September the Alberta-based company asked the National Energy Board (NEB) for a 30-day suspension of the two project applications. TransCanada said it needed time to review recent changes announced by the NEB on environmental assessment factors and other issues related to the projects. In August, the NEB announced it would expand its assessment of the project into risks associated with potential accidents and system malfunctions that could cause oil spills. It also said it would probe the "upstream and downstream" greenhouse gas emissions and the possible impact of the emission reduction targets on the economic viability of the projects. Energy East opponents, including environmental groups and some municipalities along its route, claimed the news as a victory. The premiers of New Brunswick and Alberta, provinces which stood to gain economically from Energy East, expressed disappointed at the termination. Canada has been trying to diversify its reliance on the United States for its energy exports. The energy sector is seeking increased pipeline capacity to move oil out of Alberta to new markets. But a number of proposed projects have languished or been cancelled amid a commodity price slump, regulatory hurdles, and public opposition from environmentalist groups and others. Energy East was a C$15.7bn ($12.5bn; £9.5bn) proposed 4,500km (2795 mile) pipeline that would have carried 1.1m barrels of crude oil daily from Alberta and Saskatchewan to Eastern Canada refineries. It included converting an existing gas pipeline to carry oil as well as building new sections. TransCanada applied to build the project in 2013. The Eastern Mainland project would have built an additional 279km (175 mile) new gas pipeline in Ontario.